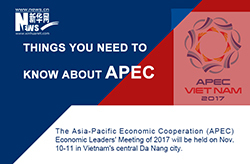 The Asia-Pacific Economic Cooperation (APEC) Economic Leaders' Meeting of 2017 will be held on Nov. 10-11 in Vietnam's central Da Nang city. U.S. President Trump is visiting China, with bilateral trade high on the agenda. 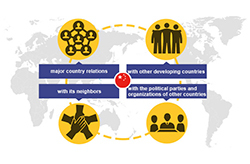 Here's a look at the trade ties between the world’s two largest economies. 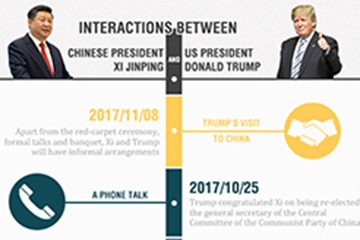 At the invitation of Chinese President Xi, US President Trump started a state visit to China from Nov. 8 to 10. 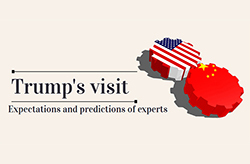 Researchers from two countries share their expectations from this "historic" event and predict the future path of Sino-US relations. 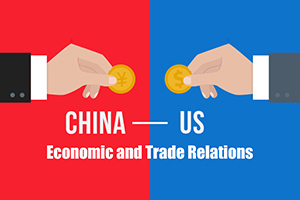 The following is a brief introduction of interactions between Chinese President Xi Jinping and US President Donald Trump. China will continue to hold high the banner of peace, development, cooperation, and mutual benefit and uphold its fundamental foreign policy goal of preserving world peace and promoting common development. 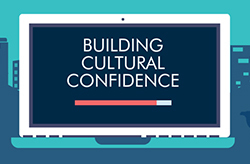 "Culture is a country and a nation's soul." -- Xi Jinping. 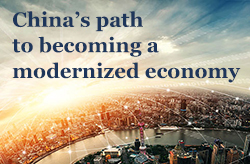 It is imperative for China to develop a modernized economy, Xi Jinping, general secretary of the CPC Central Committee, said in the report delivered at the 19th CPC National Congress. Let's look at the path he outlined in the report. The report delivered by Xi Jinping at the opening of the 19th CPC National Congress highlights a new era, new thought and a new journey. Let's take a look at each in detail here. 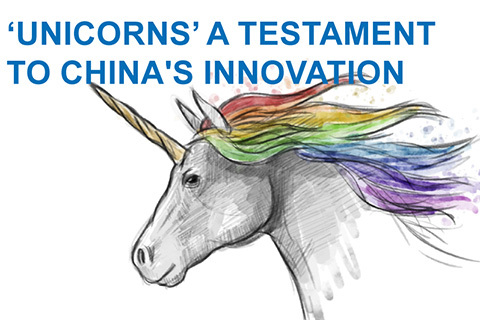 Newly emerging Chinese "unicorns" -- private startup companies valued at more than US$1 billion -- have helped show the world China's strength in innovation and entrepreneurship. China has contributed more than 30 percent of global economic growth over the past five years, according to the report delivered by Xi Jinping at the opening of the 19th National Congress of the Communist Party of China. 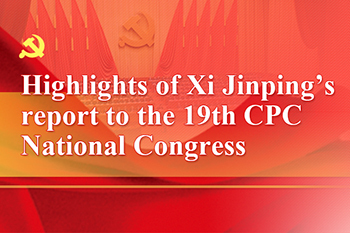 The 19th National Congress of the Communist Party of China (CPC) opened on Oct. 18 in Beijing. 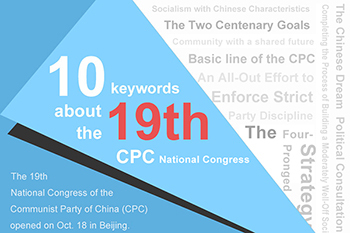 China.org.cn selects 10 keywords for you to better understand China's highly important meeting held every five years. 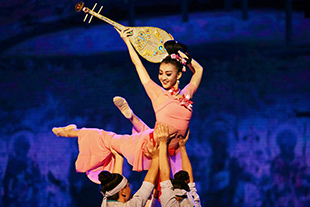 Let's take a brief look at China's major achievements in cultural sector through a series of numbers. 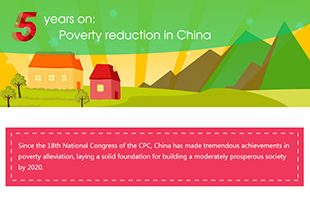 Infographic shows the highlights of a report delivered by Xi Jinping to the 19th National Congress of the Communist Party of China (CPC) on Oct. 18. 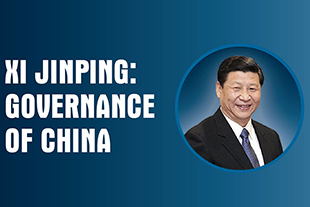 Chinese President Xi Jinping's governance of China since 2012. 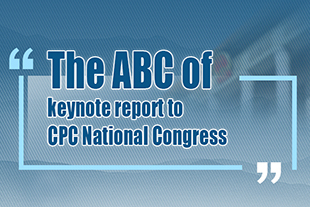 The 19th CPC National Congress will be held this year. 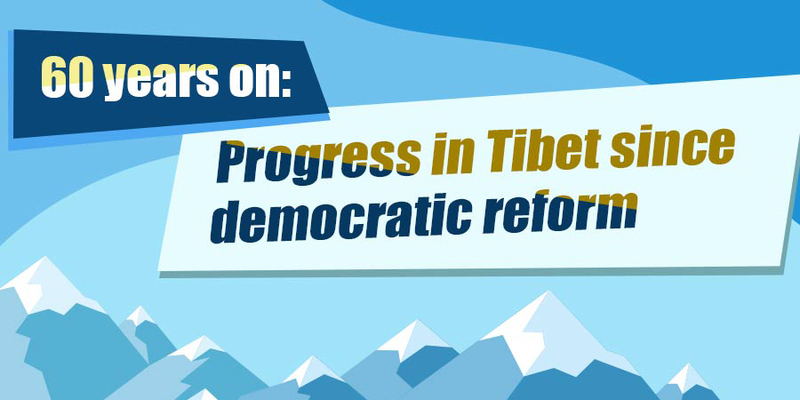 One of the important agenda items is to hear and examine a report of the CPC Central Committee. Why this document is so important? Here are the answers. 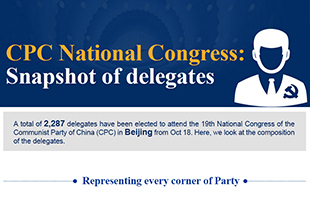 A total of 2,287 delegates have been elected to attend the 19th National Congress of the Communist Party of China in Beijing from Oct 18. 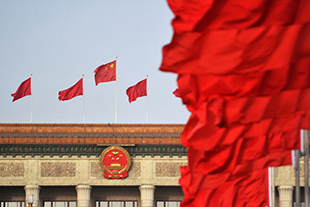 The Communist Party of China will hold its 19th National Congress on Oct. 18, which occurs once every five years. 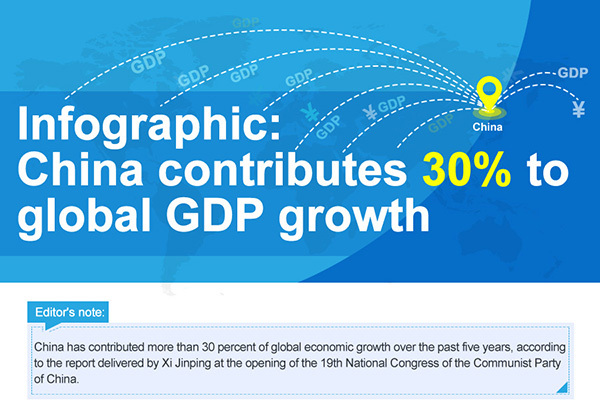 China SCIO has compiled a series of infographics to summarize the country's achievements made in the past five years. The following is a look at poverty relief efforts in China. The following are some figures in China's economy. The infographic illustrates how the world's biggest water diversion project has brought tremendous benefits to the socio-economic development in Beijing. 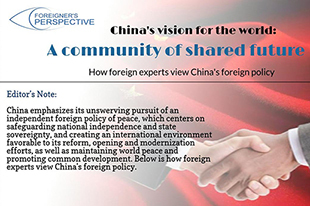 Below is how foreign experts view China's foreign policy. 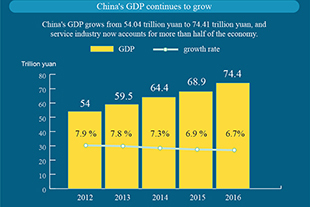 The following six graphics depict China's achievements over the last five years (2013-2017) in economics, poverty alleviation, employment, cutting of red tape, environmental improvement and military reform. The State Council executive meeting on Sept. 20, decided to further expand employment and promote pilot zones for cross-border commerce. 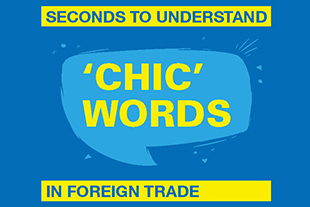 The charts will guide you through the "unfamiliar words" and also lead to an easy understanding of the new measures in foreign trade. 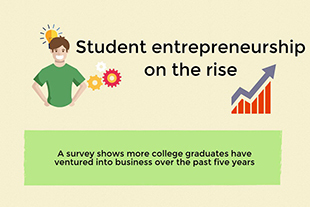 A survey shows more college graduates have ventured into business over the past five years. 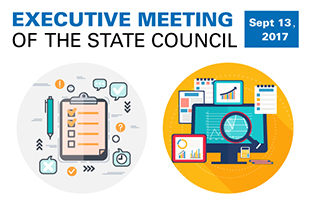 The State Council executive meeting on Sept. 13 urged strengthening efforts in inspecting the implementation of major decisions and deployment. 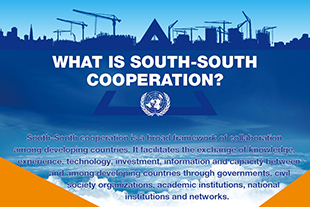 South-South cooperation is a broad framework of collaboration among developing countries. Chinese President Xi Jinping stressed that the Sustainable Development Goals (SDGs) draw up a new blueprint for global development and provide fresh opportunities for international cooperation. 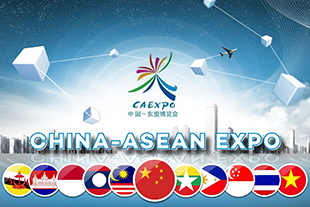 Since launching in 2004, the China-ASEAN Expo (CAEXPO) has grown into an event of international influence, and the 14th CAEXPO will be held on September 12-15, in Nanning, south China's Guangxi Zhuang Autonomous Region. 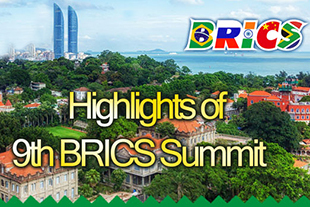 From September 3 to 5, the leaders of Brazil, Russia, India, China and South Africa met in Xiamen for the 9th BRICS Summit. 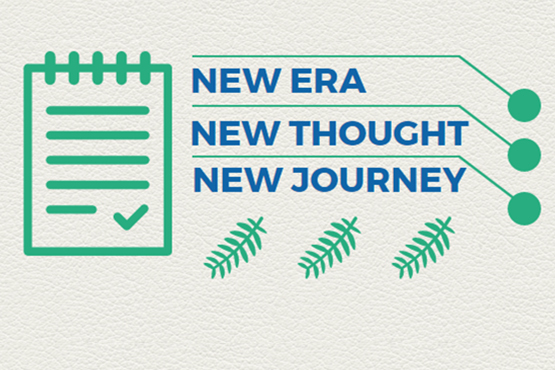 What are the highlights of this year's summit? Here are what you want to know.